Gaithersburg, Maryland, USA - May 10, 2013- GL Communications Inc. announced today the release of its latest product Long Term Evolution (LTE) Emulator for X2 Interface. Speaking to reporters, Mr. Jagdish Vadalia Senior Manager for product development of the company said, "Long Term Evolution is the all packet architecture that mobile networks are in the process of transitioning. It will permit vastly higher data rates to mobile smartphones, making voice, video, and data truly integrated for the first time – thru a single access technology. This is yet to be accomplished over wired networks. In simple terms, LTE consists of a "Packet Core" and a network of eNodeBs (as shown below). eNodeBs have two interfaces, the X2 interface permits eNodeBs to talk to each other directly, and the S1 interface permits talking to the "Packet Core." 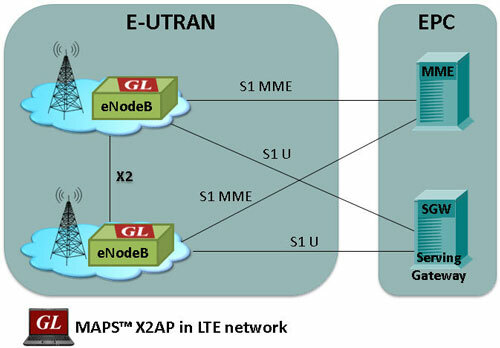 He added, "GL has introduced LTE X2 Interface Emulation to test and verify eNodeB implementations through its MAPS architecture. GL's Message Automation & Protocol Simulation (MAPS™) is a multi-protocol, multi-technology platform used for the emulation of a variety of communication protocols over IP, TDM, and Wireless networks. MAPS™ can be used to test signaling over legacy networks (such as CAS, SS7, ISDN, PPP and more), IP networks (such as SIP, MGCP, MEGACO, SIGTRAN, Diameter…) and also the Wireless technologies including GSM, UMTS, and LTE networks. Recently LTE X2-AP has been introduced." Mr.Vadalia further added, "GL's MAPS™ X2 Application Protocol (X2-AP) Interface Emulator is used to co-ordinate handovers and perform load management between eNodeB (Evolved Node B) network elements - Source eNodeB and Target eNodeB. The MAPS™ X2-AP test tool is designed with specific test cases, as per LTE 3GPP mobile standards. It supports powerful utilities like Message Editor, Script Editor, and Profile Editor which allow new scenarios to be created or existing scenarios to be modified using messages and parameters." Simulate two eNodeB elements in LTE X2-AP interface. Generates hundreds of UE Signaling (Load Testing). Generates and process X2-AP (valid and invalid) messages. Supports Mobility Management, Load Management, Reporting of General Error Situations, Re-setting X2, Setting up the X2, and eNodeB Configuration Update procedures. Supports customization of call flow and message templates using Script and Message Editor. Ready-to-use scripts for quick testing.